A former regional journalist is fronting a national Christmas campaign to raise awareness of the condition with which he lives. 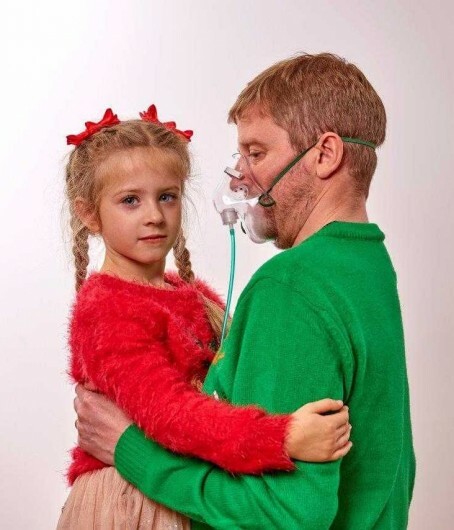 Martin Smith, who worked on the Coventry Telegraph and Brackley Post, suffers from cystic fibrosis and will appear in a video for the Cystic Fibrosis Trust with his five-year-old daughter Emily. Martin had been the Telegraph’s multi-media editor, but left the industry in 2012 due to his condition and has since gone on to write a series of best-selling children’s books about an 11-year-old boy with cystic fibrosis. The genetic condition, which has no cure, causes a buildup of mucus in the body’s organs and can lead to infections which severely damage the lungs. The median life expectancy of a sufferer is 31. In the video, Martin talks about how a member of his family has cystic fibrosis and how he hopes the family will be able to enjoy many more special moments together. As the short film ends, it shows that Martin is the one with cystic fibrosis and he hopes to spend much more time with his daughter. Martin, 38, said: “Cystic fibrosis kills, but the Trust’s dedication to funding new research and treatments provides a glimmer of hope for brighter days ahead. We need that support; we need people to understand the battle of cystic fibrosis, and we need every chance to live longer lives. To see the video and to make a donation to the Cystic Fibrosis Trust, click here. Another superb bit of work from a wonderful human being who amazes friends, colleagues and family on a regular basis. I would urge anyone who doesn’t understand cystic fibrosis to watch the advert, and please help this charity to give Martin and others like him a fighting chance in their battle. I’d like to echo what Darren says. Martin is one of the bravest colleagues I’ve had the honour to work with (in internal comms in recent years) – and he is also a bloody good journalist to boot. This is a great campaign and worthy of our maximum support.